If you are like a lot of guys, you want a great winter coat, but not a lot of "bulk"….The Ridgeline jacket by Tri-Mountain is perfect. 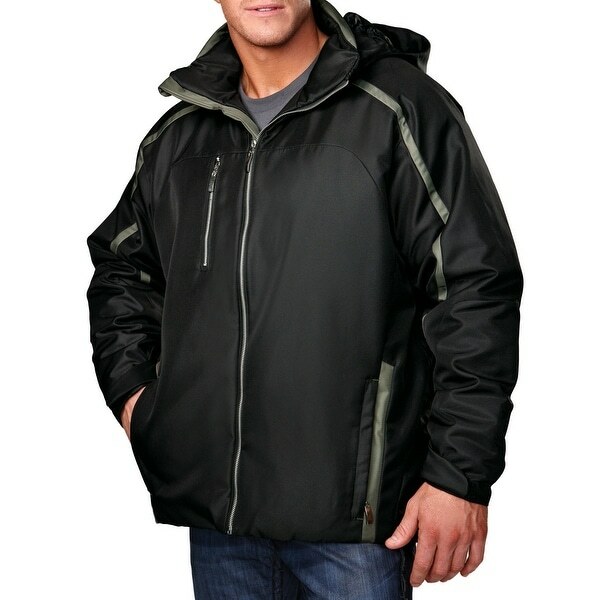 Constructed of wind and water resistant polyester fabric, this coat has a medium weight quilted tricot lining that will keep you warm enough without bulking you down. It has a removable hood with an elastic drawcord to keep out the wind, Three zippered outside pockets, and two inside pockets with zippers and flaps for your phone, wallet etc. The sleeves have elastic cuff to hold them in place with hook& loop tighteners as well. The bottom hem is open, with elastic draw cord for a perfect fit. Zippered access for embroidery too. This one is priced so low, you may want one of every color! This is an exceptional jacket. It's made of high quality material. For the price you can't get a better deal. This is the 2nd coat I've bought from Overstock and both have been great deals. Anywhere else you'd find this cost you would pay at least $60 for it. Overstock does it again! Love this coat. Very rain and snow repellant! Very impressed with the overall quality of this coat. Was expecting a cheap plastic zipper for the price but was pleasantly surprised to see nice metal zippers. Nice and warm. Rain resistant. Got this just in time for the latest cold snap. Glad I did. Lots of pocket space too. This coat came in and was very light but warm my husband really likes it . I love this jacket. It looks great and is true to size. I’ve gotten many compliments in just the few days I’ve had it and shipping was very fast. Thanks Overstock! I purchased this for my teenage sons and he likes it and the fact that it's lightweight but warm. got this for my son he loves it is light but warm looks good on him.Good color he loves it . Very well made, comfortable too. Great jacket. Too heavy for what I need though. I need to return it. Love how it looks. I have heard good things about this brand of clothing so I thought I'd give it a try. Looks very well put together and exactly what I'm looking for. My husband wants a warm jacket that is not bulky.